The MSHS sponsored entry in Art in Bloom 2018. 1) It stretches your mind. 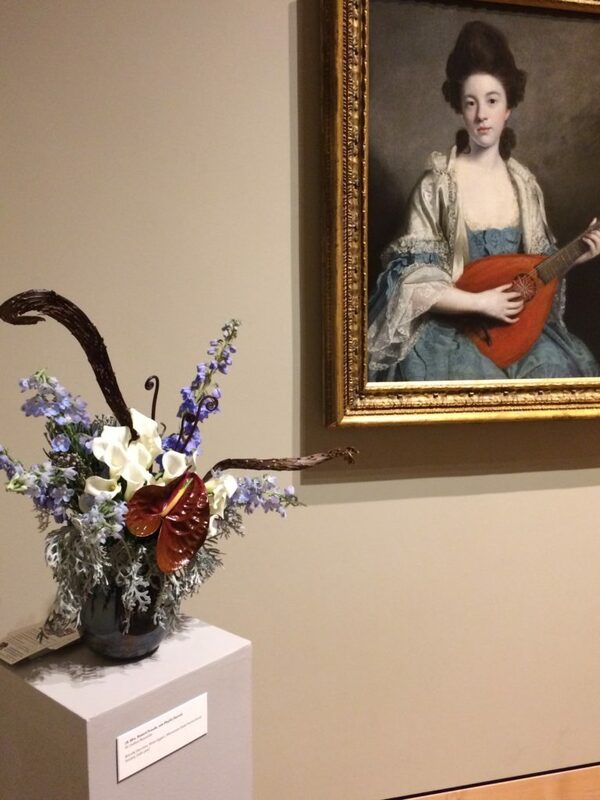 Check out the interpretation that staff member Brenda Harvieux and volunteer Brian Eggert did of Mrs. Robert Froude, née Phillis Hurrell by British painter Sir Joshua Reynolds. You see the guitar, right? 2) It’s free! Mia (as the institute prefers to be called) is free and open to the public, except for special exhibits. 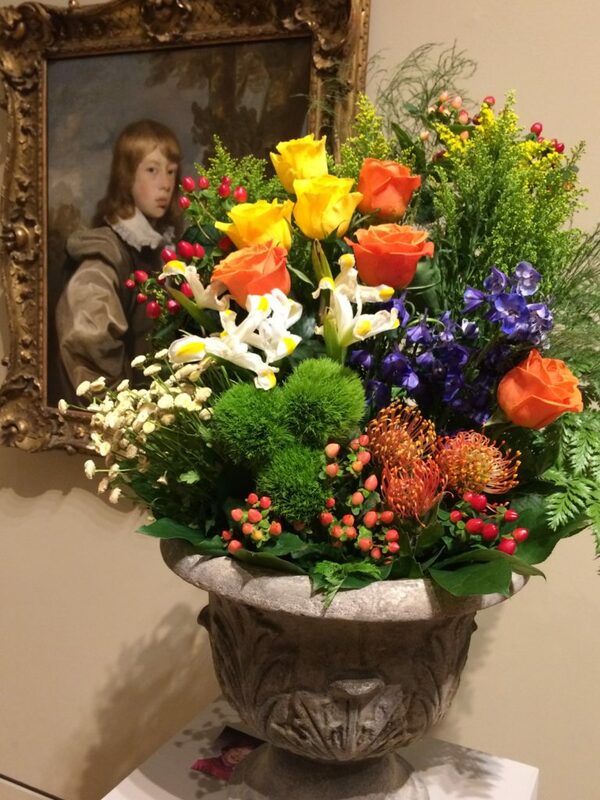 During Art in Bloom, the entire museum is open to the public. It’s a real treasure in the city and this is a wonderful chance to see it. 3) It smells good. 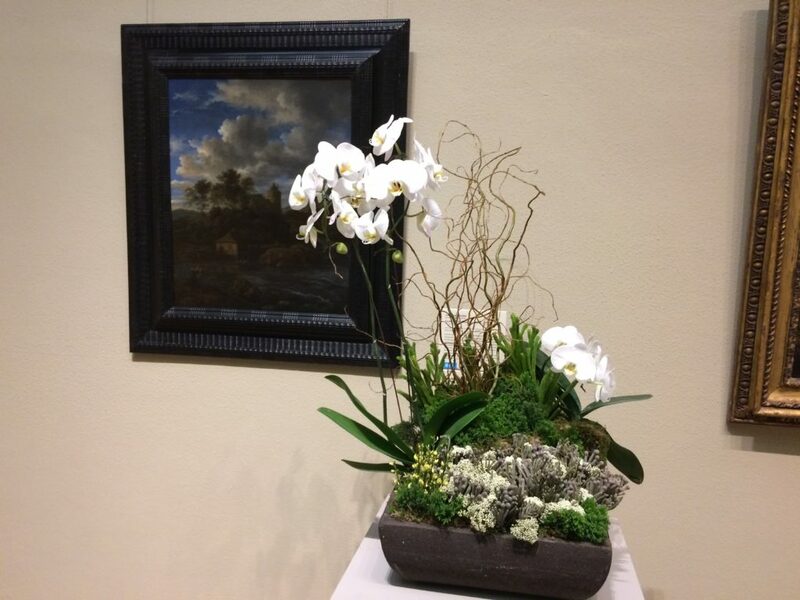 Walking down the hall of the museum in search of the next Art in Bloom entry, I was transported. Lilies were especially delightful but with all the fragrant flowers in the displays, you can catch all sorts of scents. 4) You don’t have to be a pro to enter a design. While some of the designs are done by pros—folks like the Bachman’s design team–but others are just regular people who enjoy flowers and art. Every interpretation is interesting and so personal to the art work and the designer. Elizabeth Franklin of the Edina Art Council did this interpretation of “Portrait of James Ward” by Gilbert Stuart. That’s James Ward behind the flowers. 5) There are new designers every year. While many designers have exhibited for several years, there are always new ones to see, and new artworks that are on display. 6) Garden-themed merchandise! The museum gift shop is a great place to stop for an artful scarf, a cool notebook or a book on art, but for Art in Bloom a special shop is opened that sells a variety of dishes, cards, clothing and other interesting items with a garden theme. 7) Good food. The museum’s restaurant is run by Agra Culture Kitchen and Press, a Twin Cities-based chain of restaurants with organic and healthy ingredients and good coffee. Since I visited Art in Bloom around suppertime, I decided to sit out traffic and have a light supper at the restaurant. The food is good, so is the wine. 8) It’s family friendly. Saturday is a great day to bring youngsters to the museum. There will be special events for children, including chalk art and music. But don’t spend all your time in the kids’ area. This a great event to introduce children to art and how to appreciate it. High culture is for everyone. 10. It’s a tradition. Art in Bloom has been around for 35 years. It is a rite of spring. When you go, be sure to check out the MSHS display in gallery 307, right near the lady with the guitar.